Welcome to the first in a series of postings by J. Carlton Collins, author of the Journal of Accountancy’s Technology Q&A Column, a monthly feature in the magazine addresses questions sent in by members about software, hardware, networking and much more. Here is an excerpt from a recent column that discussed “green” strategies. Q: Should we be concerned about the amount of energy our computers consume, and if so, what measures can we take to conserve energy and reduce the cost of operating our computers? 1. Upgrade CRTs to LCDs. Compared to older CRT monitors, today’s flat panel LCD screens are not only easier on the eyes, they consume about 70% to 75% less energy (assuming similar size CRT and LCD screens), which, depending on amount of use and the cost of electricity, could translate to an annual energy savings of approximately $15 per year per monitor (assuming a 20-inch LCD monitor is used four hours a day at the average electrical rate of 15 cents per kilowatt hour). 2. Adjust your monitor power settings. Even when using LCD screens, your monitor typically consumes two-thirds of your computer’s energy needs. If you can do so without affecting your productivity, decrease your monitor’s brightness setting. Some monitors (usually laptops) allow you to adjust your settings so the monitor dims after a couple of minutes of inactivity. Also, make sure that your monitors are set to automatically turn off after 10 to 30 minutes of inactivity. 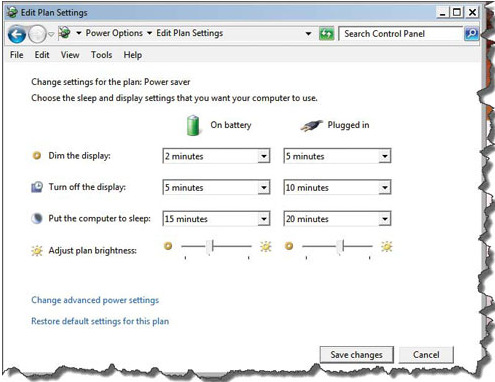 Keep in mind that on laptops, Windows provides additional power-setting options depending on whether you are plugged in or running on battery (pictured below). Note: Be aware that while screensavers may black out your screen, the monitor remains on and continues to consume electricity; hence, the option to automatically revert to standby mode saves more energy than does the screensaver option. 3. Turn monitors off. Some monitors use a significant amount of power even in standby mode. If you are like me and use large monitors (I use two 40-inch LCD monitors on my desktop computer system), then turning off your monitors instead of allowing them to go into standby can conserve a meaningful amount of energy over the course of a year. 4. Computer power management. 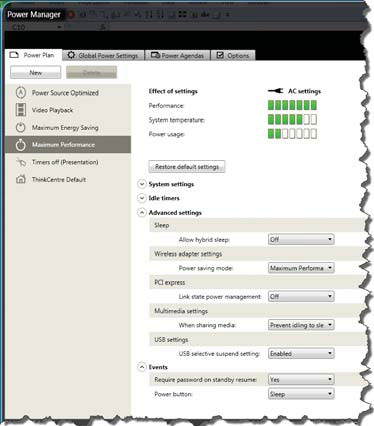 Some computers offer stronger power management options than Windows does. For example, my Lenovo desktop’s power settings (pictured below) enable me to also manage the power usage of my wireless adapter, video card, USB drive, and other settings. You should explore your computer system for additional energy-saving options. 5. Draft mode printer setup. Set up your printer twice in Control Panel; the second time, set the default printer settings to draft mode and name that printer setting “Print in Draft Mode”. That way you can reduce your toner usage by as much as 75% by printing draft copies using this printer selection. This tip may not reduce energy consumption, but it will save money via reduced toner use and may reduce the toner and cartridges that eventually wind up in landfills. 7. Hard drive settings. In Control Panel, you might adjust your hard drive so that it stops spinning after approximately 10 minutes of inactivity to conserve energy (the default setting is 20 minutes). 8. Upgrade your hard drive to SSD. One of your best energy-saving measures might be to upgrade to a computer with a solid-state drive (SSD). This step will not only help your computer perform faster, but SSDs also use almost no energy when idle. 9. Keep external hard drives turned off. If you have an external USB hard drive connected to your computer for backup or archive purposes, turning it off until you are ready to use it will conserve energy. 10. Microsoft Windows 8. Windows 8 is reportedly up to 12% more energy efficient than Windows 7 when installed on today’s energy-efficient computers, and far more efficient on older computers.Note: Windows 8 requires a CPU running at 1GHz or faster and at least 1 gigabyte (32-bit) or 2 GB (64-bit) of RAM.